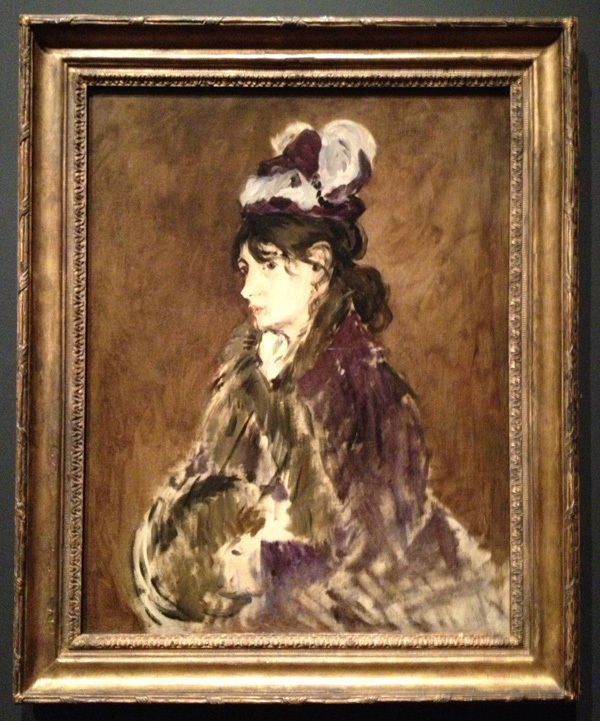 Last weekend, I went to the current Manet exhibition at the Royal Academy. To be honest, I had been prepared to let this one pass me by. Though I do like Impressionism, I can't say that I have ever been particularly drawn in by Manet. I suppose that I haven't been exposed to that much of his work in the flesh and none of his most reproduced and lauded paintings have really spoken to me. In addition, the focus of the exhibition was portraiture and, unless it's the work of an artist I particularly love, I am generally less inclined towards straight portraiture than other subjects. However, I was enticed into going by one of my friends, as his enthusiasm made me think again about my readiness to dismiss the exhibition. And I am so glad I allowed myself to be enticed because it was truly wonderful. It encouraged me to do some reassessment, it amused and surprised me, it presented some revelations and impressed me with its variety. 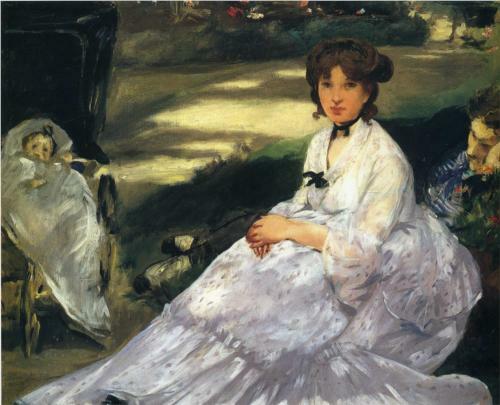 It helped me to place Manet within the course of art history, particularly with regard to the hints of modernist techniques and style in his paintings. And, always a sign of a good exhibition, I was just stunned and overwhelmed by the beauty of it all. The painting shows a young female horse rider and I just thought her wonderful. Her androgyny particularly appealed to me - she could almost be a beautiful young man. 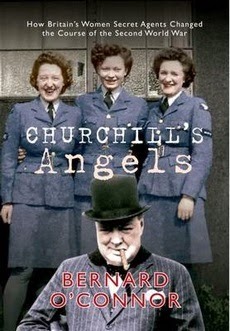 Someone else might see it differently but, to me, it's rather an empowering female portrait. She feels very modern, she's dressed for action (perhaps it helps that she is cut off just below her waist, so you can't see the ridiculously impractical skirt she was probably wearing...). She looks like she knows what she's doing and you can imagine this young lady keeping up with the boys. And this all made me rather fond of her. So, sure, I might let Manet paint me, if de Lempicka and Burne-Jones weren't available. I'll leave you with a couple of more favourites from the exhibition. Absolutely! Good art can just have the most wonderful effect - sometimes I'm so overwhelmed I don't know what to do with myself and feel like I could burst! God on you for being enticed - and the friend for enticing. Your immersion in artistic endeavours is delightful. Refreshing! I have noticed before that the well known paintings of a particular artist are not necessarily ones that I like best if I see an exhibition. You've tweaked my interest in Manet with your description of your visit and your choices of paintings. He was mentioned elsewhere recently. I like your imaginings of the androgynous rider. Interesting that the painting is called "The Amazon". I immediately thought of the usual reference to a large, muscular, manly woman - Amazon woman. So maybe that fits with your analysis. I mean her keeping up with the lads, androgyny - not muscles etc. I'm glad that I managed to entice you in turn, after my being enticed! There was some explanation in the exhibition about women riders being called Amazons in the Victorian period - though I can't remember the proper detail now, and I'm not having any luck finding any more explanation on the internet... Which is a shame, because it certainly intrigued me! The Amazon has always been one of my favourite of Manet's works. 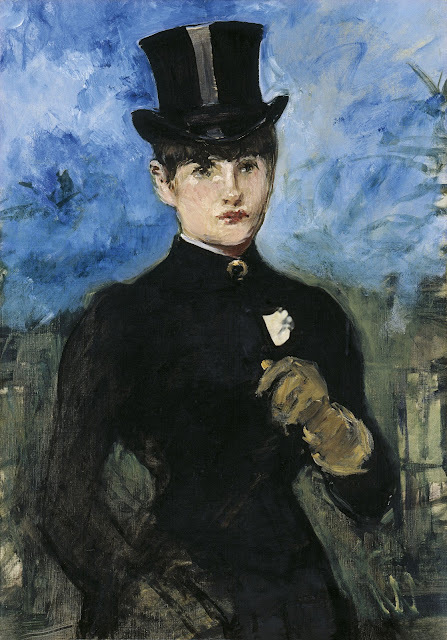 There is simply something about an elegant woman in a top hat that I adore with all my might (and all the more so if it's part of an equestrian ensemble, as is the case in this painting). One of these days I get especially daring and buy a vintage (or vintage appropriate) one and try the look out at long last myself. Ha ha! I had the same thought about top hats - I even had a quick browse online when I got home. It is a wonderful look and I think it could definitely be pulled off, especially if one didn't get one of the overly tall and ostentatious ones!